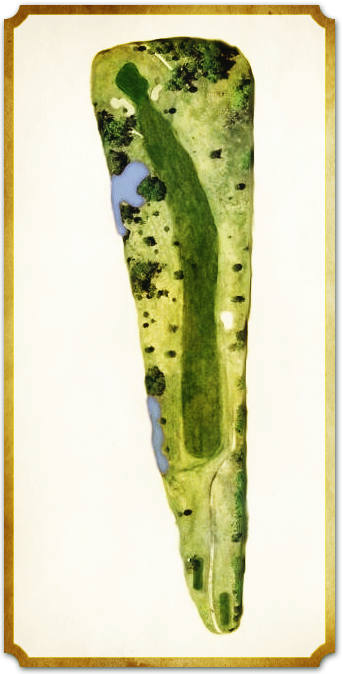 Considered by many to be the course's signature hole, this par 4 is sure to test your mettle from tee to green. The tee shot to this narrow fairway is flanked to the right by a fairway bunker and out of bounds, to the left by a stand of tall palms with an appetite for golf balls. Any drive landing in the short grass, however, will kick towards the center. You will be left with anything from a middle iron to all the fairway wood in your bag to a contoured, elevated green. Due to the slopes of the putting surface, the toughest pins are up front. Just be thankful the front right shelf only has the flag set on it during the historic Riviera Open, the longest-running mini-tour event in the United States.